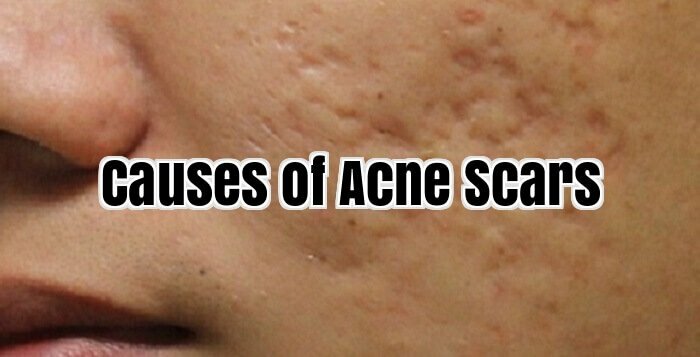 1.2 What Causes Acne Scarring? If you not only suffer from acne but are also worried about permanent scarring, don’t lose hope. Acne has actually been around for centuries, and mankind has come a long way towards understanding its cause and what can be done to prevent and cure it. Acne is basically just the inflammation of the hair follicle under the skin. There are several causes contributed to this inflammation, but most often it’s due to abnormal development of cells inside the hair follicle, leading to the formation of a plug that inhibits the normal movement of hair, skin cells and sebum (oil). The result is an enlargement and rupture of the hair follicle, which causes oil and the bacteria that normally live in the hair follicle to spill into the surrounding area, leading to the swelling and redness we know as acne. A secondary contributing cause is hormones called androgens. Although everyone has androgens, they tend to be higher in men. Androgens promote the production of sebum (oil) that exacerbates plug formation. Not all acne necessarily turns into a scar. When scarring occurs, it’s usually because your body has pumped too much collagen into the area to treat what it perceives is an infection. The scar you see is actually the excess collagen which has clumped together and formed a protective barrier over the area that was blocked and inflamed. There are several categories of acne scars, ranging from mild to severe. You’ll need to determine the type of scar you have in order to develop the best method of treatment. Ice Pick Scars – Narrow and deep, ice pick scars have the appearance of being pierced by a needle. Usually the result is of a deep blemish or cystic acne. Rolling Scars – Formed by fibrous bands of tissues created between layers of skin, rolling scars resemble a wave of scars on the surface of the skin. Boxcar Scars – These are slightly wider than ice pick scars, and include round depressions in the skin. Keloid Scars – These scars appear as raised masses of tissue and are almost always larger in size than the original acne. It’s also known as hypertrophic scars. Science has come a long way in the development of effective treatments for acne scars. Generally, if scars aren’t too severe there are many creams that will help break up and remove the excess collagen, get rid of dead and unhealthy skin cells, promote the rejuvenation of new, healthier skin cells, and stimulate the production of amino acids and proteins your skin needs to stay firm, moisturized and healthy looking. Mild to moderate acne scars can benefit from dermabrasion and chemical peels, which exfoliate damaged skin and help to improve the overall texture of skin. Severe acne scarring may need surgical treatments such as dermal fillers to fill in deep scars or subcutaneous incision to cut away scar tissue. Your doctor can talk to you about the type of acne you have and the best options for treating it. The most important thing to remember is that acne scarring is not permanent, and there are plenty of well-established treatments to get your skin back to the healthy and flawless state you had when you were younger. It’s an unfortunate fact that a lot of people who suffer from acne will end up with scarring as a result. The majority of sufferers just get on with life and learn to accept the scarring, but most people might be surprised to learn that this doesn’t need to be the case as it’s possible to reduce scarring due to acne in a number of ways. Here are some tips to help you to remove scarring. Before we get going though, please consult a doctor if you have any doubts about these tips, remember that what is suitable for one sufferer may not be suitable in your case. That said, let’s get going. 1. The anti-inflammatory properties of Aloe Vera are well recognised. You should apply Aloe juice or Aloe Vera based cream to the affected areas at least twice daily. This will help reduce scarring and hep to heal the lesions caused by the Acne. 2. Another fantastic natural product is Vitamin E. Very gentle to your skin, this substance can be used in capsule or oil formats. Regular use will rapidly reduce scarring and remove blemishes. 3. Use a potato! No I’m not kidding. Slice the potato and lay the slices onto your skin. Leave them there for about half an hour and then remove, wash your face and allow the skin to dry naturally. 4. A mixture of lemon juice and rosewater works wonders. First get a bowl and mix equal quantities of these together. You need to apply the mixture to your skin and leave it for about 30 minutes. Rinse and then repeat the process again over a 15 day period for best results. Blemishes scarring and even the acne itself will all be dramatically reduced by this method. 5. Of course, modern medicine offers a number of solutions to help reduce scarring in acne sufferers. Laser treatment and a process called microdermabrasion are both currently very well loved. Both methods enhance the complexion by removing a thin layer of skin from the top. Safe and relatively painless; they are still a last resort for many people due to their high cost and the fact that they are not a natural treatment. Hopefully these tips have proved useful to you, and have shown that it’s not necessary to live with unsightly acne scars. Always remember that no matter how terrible your skin may seem there are many natural treatments that you can apply to reduce scarring and get your healthy complexion back. None of the statements made on www.scarcreamtruth.com have been reviewed by the Food and Drug Administration (FDA). The advices and products mentioned on www.scarcreamtruth.com are not intended to diagnose, treat or prevent any diseases. You should consult with your doctor before using any product mentioned on www.scarcreamtruth.com. We may receive commission or other income on certain products. However, this does not impact our reviews and comparisons mentioned on www.scarcreamtruth.com. We try our best to keep things fair and balanced, in order to help you make the best choice for you. Any and all trademarks, logos, brand names and service marks displayed on www.scarcreamtruth.com are the registered or unregistered trademarks of their respective owners.